The Real Problem: England Is Not The Right Height. England [sic] is just a small island. Its roads and houses are small. With few exceptions, it doesn’t make things that people in the rest of the world want to buy. And if it hadn’t been separated from the continent by water, it almost certainly would have been lost to Hitler’s ambitions. Yet only two lifetimes ago, Britain ruled the largest and wealthiest empire in the history of humankind. Britain controlled a quarter of the earth’s land and a quarter of the earth’s population. That’s from his increasingly ironically titled book, No Apology. And (b): Mitt shouldn’t worry about apologizing to foreigners for America; if what we’ve seen just in a few hours is any guide, he’ll have a months long (at least) backlog of personal sorries to deliver by next Tuesday. Oddly, I think I’ve got to start reading Mitt’s golden prose soon. I’ll tell you all why after I’m done with it…. *”Slime-doggy” is an insult directed at Arnie in some otherwise long forgotten episode of L.A. Law. I have for years longed to fling it at just the right target. I feel….satisfied. Romney in London. Come on. We needed this. It’s a little comic relief. Kind of like Mr. Bean, only he’s an American. As the Guardian has it that would be would-be-President Bean to you proles…not exactly the image sought at the first dance of a candidate’s foreign policy debutantant ball. I hear there’s a guy called Mitt Romney who wants to know whether we’re ready. Are we ready? Images: Jones’ Views of the Seats, Mansions, Castles Etc. 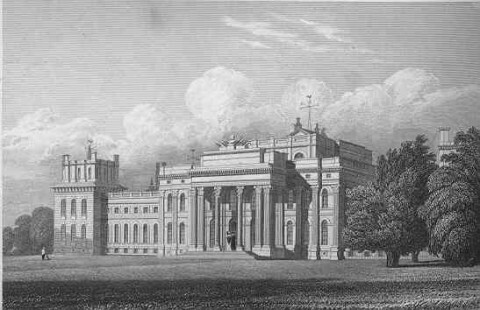 of Noblemen and Gentlemen, View of Blenheim Palace, 1829. 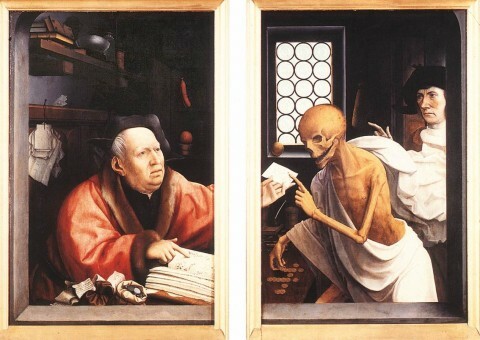 Jan Prost, Death and the Miser, before 1529. This entry was posted on July 26, 2012 at 2:38 pm and is filed under ridicule, Romney, Stupidity. You can subscribe via RSS 2.0 feed to this post's comments.